Ash storms blasted Adagio all through the night, hissing and scratching against the window of Robin’s room, but he barely noticed. Morning came and went in similar fashion. He hadn’t slept or eaten since starting work on the angel disk the previous afternoon. “Incredible,” he said aloud for what must have been the three-hundredth time—not that he was keeping track of that, either. He’d completely forgotten everything but the disk. He had a stack of paper covered with translations, notes, and corrections, most of which were scrawled so haphazardly that even he would have trouble reading it later. But that didn’t matter. All that mattered was the revolutionary information flowing from the disk’s inscription. It was a Founding-by-Founding record of an angel civilization’s attempt to colonize land. If it was to be believed—and at this point Robin had no reason not to believe it—the angels had actually built a water-filled city, like a giant aquarium, on a peninsula that, according to the descriptions, wasn’t far from where the fishermen had found the disk. A good portion of the inscription was taken up with growth records of the city’s population, descriptions of the algae and fish they raised for food, and a few incredible passages describing technological developments or cultural practices. There was scarcely a sentence in the entire thing that wouldn’t rock the academic world all by itself. There were also several passages alluding to light and dark, and Robin had been at a loss for hours trying to decipher them. Finally, he had realized that the references to light and dark weren’t literal: the angels had named their city “Light”. The name carried some literal connotation in that there was more light from the Whale on the surface than undersea, but most of it seemed to stem from the angels’ relief at having escaped the “dark ones” and what Robin took to be some kind of undersea war. If he was interpreting the information correctly, Robin realized that this disk proved more than the fact that angels were sentient and intelligent. It proved that they were moral—creatures with understanding of right and wrong, and the means and will to fight about it. The implications of that were staggering. 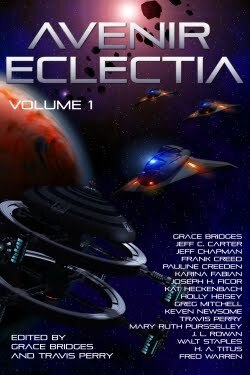 Even Robin, whose love of revolutionary discoveries was unrivaled, had to wonder if Eclectia was ready to face this. I like how this turned out, Mary.